A whopping £8200 has been donated to the HIOWAA! Members of the choir joined other choirs from Romsey to take part in the Mayor of Romsey's Civic Service held in the memorial park in Romsey on Sunday 20th September 2015 . 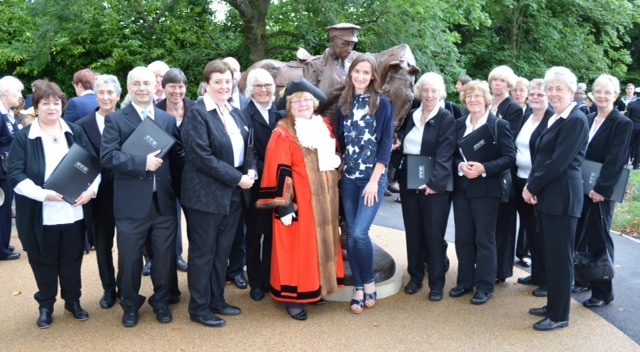 The service included a blessing of Romsey's War Horse and Trooper statue created by artist Amy Goodman, pictured centre, which was the subject of the choir's commissioned work last November by Paul van Gulick, “Horses: a Gift to Mankind”. On December 7th 2018, choir members suitably wrapped in warm coats and hats, entertained shoppers in Waitrose with Christmas Carols all in the aid of Charity. They followed it up by a tour of some of the town's hostelries to entertain the diners and drinkers with Christmas cheer. The collection total was further bolstered by separate carol singing events at Homemead House in Romsey, Brendoncare home in Winchester and at the Winchester Wessex Hotel on Christmas Eve. We are delighted to report a total of £322.53 was collected for Jane Scarth House, our local cancer support centre. I would like to say again how much we all enjoyed your concert on Saturday evening - A Night at the Opera - 1st July 2017, with Romsey Choral Society and City of Southampton Orchestra. We have received a cheque for the amount raised from the retiring collection and I am absolutely astonished and delighted. Your generous audience, choir and orchestra donated the amazing amount of £1,226.58! This is incredible and will fund over 61 hours of nursing care! • £130 pays for someone to attend Day Therapy at a Marie Curie Hospice. On Saturday 24th September 2011 we were delighted to attract singers from all over the south of England and well beyond to our 'Come and Sing' Fauré Requiem and Vivaldi Gloria in Romsey Abbey. Under the baton of Arthur Robson, Director of Choral Studies at the University of Chichester, and accompanied by the City of Southampton Orchestra, 320 singers raised £8,500 for the Southampton Hospital Red and White Appeal. A huge thank you to everyone that took part and to our sponsors for the event: The White Horse Hotel Romsey. 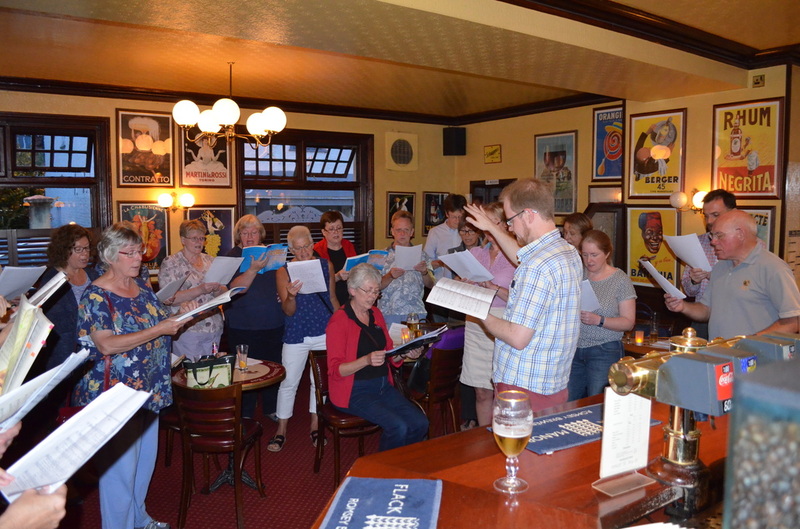 To mark the final rehearsal of the 2015/16 season the singers gathered in La Parisienne after the rehearsal to surprise customers with an ad-hoc performance. Great fun!